You're playing in a four deck game with DDAS (Doubling down after a split) allowed. You're dealt a pair of ten-value cards, while the dealer has one of his "stiff" cards - a five - showing. You're telling yourself this doesn't happen often enough, so you may be tempted to split the cards up, in order to get the maximum dollar amount on the table. Is this something you should do? I don't think so. Let me explain. You see, you are going to win about 78% of the time when you do NOT split this hand up, as opposed to losing only 11% of your hands. When you split this hand up, however, even with doubling after split allowed, the percentages get a lot LESS favorable for you - try 34% losses on for size. Overall, you're looking at about a 13% gain by standing with your two-card 20 here. And obviously, there's more of a gain when the option of doubling-down after a split is not available. 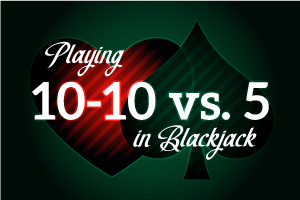 Don't get me wrong; if you had a 10 against a dealer's five you would be facing a doubling play. But pulling the trigger with a split here could result in shooting yourself in the foot, and you wouldn't want to do that. Expert card counters can take advantage of the situation and split ten-value cards where applicable, but Basic Strategy players should not fool around here. The best policy you can follow is to not break up hands that are winners. Your easier winning opportunities are not going to be there all the time. When they are, take advantage of them!